This book’s central point is that church architecture shapes and defines our attention. Haphazard, sloppy, ugly modern churches lead our attention in haphazard, sloppy ways, perhaps even ultimately ugly ways. Hence: ugly as sin. On the other hand, traditional and beautiful Catholic architecture can – through a multitude of ways and means – orient and concentrate our attention towards a transcendent focus. “Through a multitude of ways and means”: that is to say, the way the various elements are ordered in a church, the natural lines of attention they form, and much, much else besides. In a very simple, non-technical and accessible way, Rose takes us through the means by which classical churches focus our attention in a conscious way. And how modern churches so often fail us. Yes, his text is simple, but the effect of reading it on me was profound. Quite profound. It hit me, very, very powerfully. After Rose has so skillfully pointed out the difference between a church oriented to transcendence and a haphazard church oriented to sloppiness … sloppy attention … he goes into the reasons how and why churches have come to this sorry state. Here he addresses both the construction of modern churches, as well as the way older churches have often been remodelled – and removed of all beauty, integrity and soulfulness in the process. 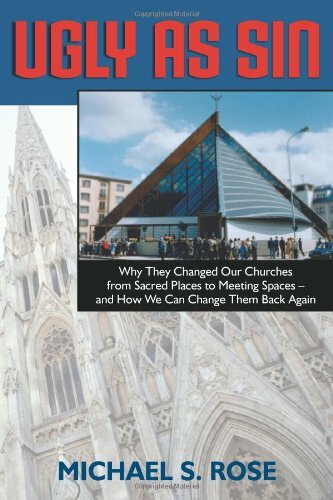 There is then, an excellent chapter: “Why modern architects secularized our churches”, wherein Rose very skillfully pinpoints all kinds of pressures to make the modern Catholic Church, less “Catholic”. These include the current prevailing dogmas of political correctness. He details ways in which designers don’t want the Church to be “too Catholic” – for fear of offending non-Catholics. Yes, this book serves to clarify the kind of subtle tyranny – all the more insidious because it is subtle – that dictates how all we do, all we create – including Church buildings – must conform these days to a bland ‘non-offensiveness’. A seemingly neutral ‘inoffensiveness’ then, which in reality is nothing but neutral – but elevates values such as inoffensiveness and utilitarian functionalism, to the status of being ‘sacred’ principles – at the exclusion, the forced exclusion of that which points to what is truly sacred and transcendent. This simple accessible book had a profound effect on me. It deserves to be widely read. This is not to say that I do not have reservations. My reservations include the fact that Rose’s understandable – very understandable – anger sometimes slips into a polemic that some may find acid or sniping. There is a difference between a healthy indignation and sniping. The latter may have the effect of unnecessarily ‘turning off’ less traditional Catholics, who might otherwise benefit from Rose’s powerful message. Yet the Church is not served by its tragic divisions between the traditionalists and those less traditional. Loving dialogue is essential, if a united front in the face of the subtle tyranny of secularism is what is desired. I am also disturbed by a paragraph on pg 198, which suggests that “a pastor or a bishop can easily save face” by telling his flock a version of history that is less than true. What Rose apparently has in mind is how clerics can speak to the faithful about the problem, without admitting the sorry decisions of the past that have led to the Uglification of the Church. But save face … Save face?!! Perhaps I misread Rose. But if I do, then so will many others. What is apparently encouraged here is being less than fully honest in order to ‘save face’. But is not dishonesty to’save face’ at the root of so much that is tragic in the Church today…? Is it not a higher path to join with our late, beloved John Paul II and our Holy Father Benedict, in having the courage to say “Mea culpa, mea culpa, mea maxima culpa”? My reservations do not prevent me from recommending this book unhesitatingly to all who care about the mission of the Catholic Church. Its message is of critical import and it is delivered with evident sincerity and passion – no small matters – in a very accessible and effective format. Moreover the book is handsomely produced with beautiful sharp, crisp black and white photography, whose standard is far above the murkiness found in many volumes. Countless photos of beautiful churches – exteriors and interiors – are counterposed with the dismalness of modern churches, forming an elegant photo-commentary to the text. I like to flip through this book again and again. The photos of the beautiful churches alone are a source of joy. These are also available in various sub-sections of our Amazon UK store here. Most also have Reviews at this site here. This entry was posted in Reviews and tagged Architecture, Catholic Arts, Dictatorship of Secularism. Bookmark the permalink. Post a comment or leave a trackback: Trackback URL.